The red berets will be meeting at 6.30pm to agree on whether to unleash chaos or not. 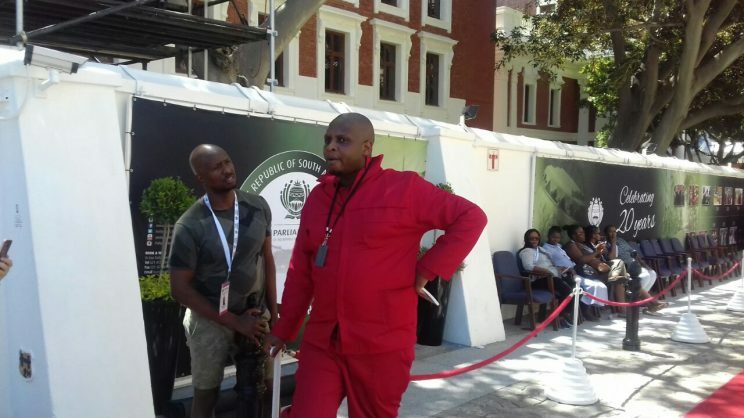 Speaking to journalists outside parliament in Cape Town, EFF deputy president Floyd Shivambu said his party would be meeting just prior to the state of the nation address (Sona) to decide on how they planned to hold President Cyril Ramaphosa “accountable” for what they allege is his involvement in Bosasa corruption. Earlier, they threatened to disrupt the Sona, and transform the proceedings into chaos. At a media briefing on Sona held last week, National Assembly speaker Baleka Mbete and National Council of Provinces chairperson Thandi Modise said no “extraordinary measures” had been put in place as they were not expecting any disruptions. But the EFF threatened to turn the address into a question-and-answer session, demanding that Ramaphosa “come clean” on the R500,000 donation made by highly controversial facilities management company Bosasa to his campaign for the presidency of the ANC. EFF chairperson Dali Mpofu told SAfm it was Ramaphosa, not the EFF, who should be blamed if there were disruptions. “Ramaphosa will be the one disrupting the Sona because we cannot sit when we have a president who has lied. We cannot be addressed by someone on serious matters of the state when he has committed an impeachable offence. So, if Ramaphosa continues without addressing the Bosasa matter, he will be the one disrupting the Sona,” Mpofu said. Presidency spokesperson Khusela Diko called the EFF’s disruption threats “very unfortunate” and said it would be politically opportunistic for parties to use the Sona to push their own agendas. Diko added that both the DA and EFF had taken the president to the public protector over the matter and that the investigation should be allowed to run its course. “It would be best for her (Mkhwebane) to be allowed to conclude her work unhindered,” she said. Shivambu said the EFF would decide on what they were going to do at around 6.30pm.